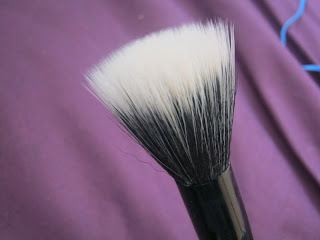 This is one brush that has been talked and raved about a lot which is the reason I got it but I was disappointed! I usually love ELF brushes as they are cheap, affordable and good quality but not this one! What does ELF say about it? This new antibacterial, synthetic haired Taklon brush is softer and more ansorbent and can be used with wet or dry products. Be a professional makeup artist and create a flawless look with this e.l.f. Studio brush! The layered bristles create a soft airbrushed look that's perfect for applying foundation or adding colour definition to cheekbones or highlighting with soft layers. Use this brush with any liquid or powder face product such as foundation, blush or bronzer to build your coverage from sheer to heavy. Now the main aim of this brush is to stipple on your foundation and to buff and blend your foundation into your skin for a ‘soft airbrushed look’. For me though this brush is too soft and flimsy to stipple anything into your skin let alone your foundation. It’s a really soft brush which is nice but it’s too soft for its use, if you apply even a tiny bit too much pressure the brush bristles start to bend out too much. From reviews I have watched/read I think the ELF Powder brush would be a better option for a stipple/buffing brush. 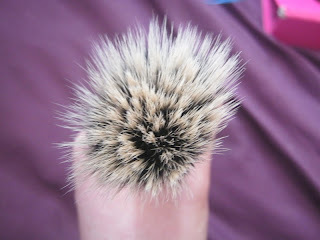 Also ELF have recently hiked their prices up so instead of this brush being £3.50 it’s not £3.75! I do have one positive thing about this brush though which is the reason I have kept it. I use it to blend out cream blushers. It’s hopeless at applying them but it does a brilliant job of softening them! At least I have one use for it! What do you think of the stipple brush? If I don’t reply to your comments at all or not straight away it’s because I am currently on holiday!